Today, there is an article in the The Sunday Times that caught my eye. 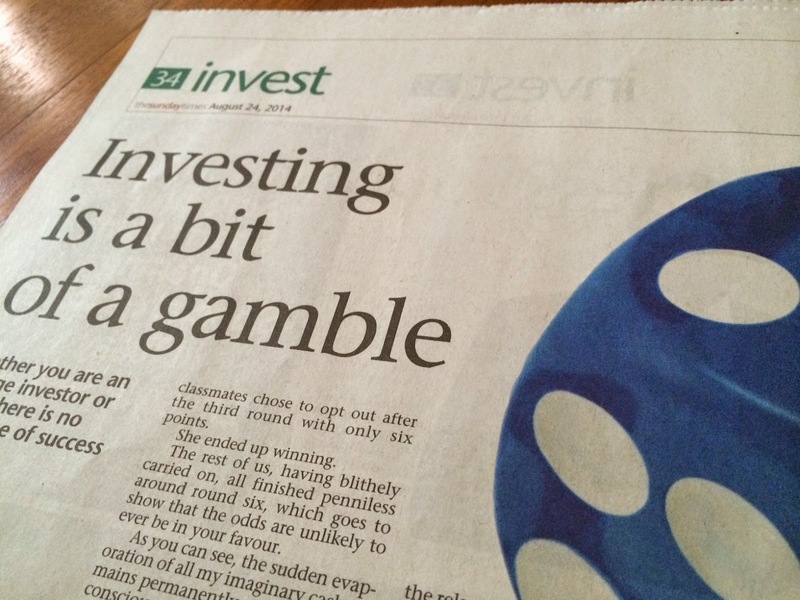 It can be found at the Invest section with the title of "Investing is a bit of a gamble" (by Melissa Tan). I totally agreed with her view that investing is kind of like gambling, but so does most other things in life. As long as we are dealing with anything in the future, we are effectively gambling as tomorrow might never come, in the first place. "My teacher, Mrs Bala, would roll a die. If the number that came up was not a five, those in the game got to add the number to their pot of theoretical gold. If the number five did come up, though, everyone still playing would have all their balances wiped out. It was a lesson on basic probability but what I recall more vividly is that one of my classmates chose to opt out after the third round with only 6 points. She ended up winning (the game)." 1. It is impossible to time the market (share movement) but it is important to have an exit strategy (i.e. when to sell the shares) in place even before we buy the share. Oh, for the loooooong term value investors, the exit strategy might be NEVER. So be it. 2. It is important to invest only with the fund that we are prepared to lose completely. 3. ETF (Exchange-Traded Fund) could be the Holy Grail for retail investor. This 80+ Great Grand Pa who lives long enough, survive long enough in the different markets like stocks, Gold, Crude Oil, and forex and not suffering from dementia at this advance age is telling you the difference! Read? Grand old investor and gambler??? Tell us what is the difference after reading? Until you have the right thinking, your next 10 years in the market could be counted as your initial few years. Cheem?